It is effective with excellent residual control. It is non-staining and unscented. It is an excellent all-around pesticide. It’s easy to understand why so many people despise spiders. Their bodies and movements belie the fact that some are dangerous to humans. Scientists believe there is an evolutionary reason for it too. These organisms like snakes and other animals represent a threat to survival, making fearing them an effective way to ensure you’ll live to the next day. Unfortunately, spiders rarely occur on their own. They often are the aftermath of an infestation of another pest problem that provides prey for them. Taking care of both issues at once is the most effective way to get it under control. You’ll find numerous products on the market with promises to help win the battle. Our roundup of the Top 3 Best Spider Sprays 2018 review highlights some of the most useful options available to get rid of them once and for all. Keep reading to learn which you should choose along with the optimal ways to apply them. Should I Worry If I Have Them In My Home? Are Spider Sprays Safe to Use? How Can I Prevent a Recurrence of Spiders? 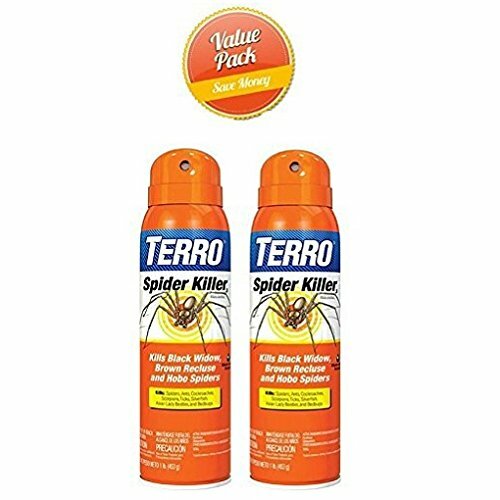 Terro T2302 Spider Killer Spray comes from a manufacturer that has specialized in pest control for over 100 years with an outstanding record of social responsibility. It’s an effective product that will kill bugs on contact. It works on a variety of other insects such as Asian lady beetles and cockroaches. If offers long-term protection for up to 12 weeks for maximum value. While it doesn’t leave any residue, we suggest using it in inconspicuous areas first. 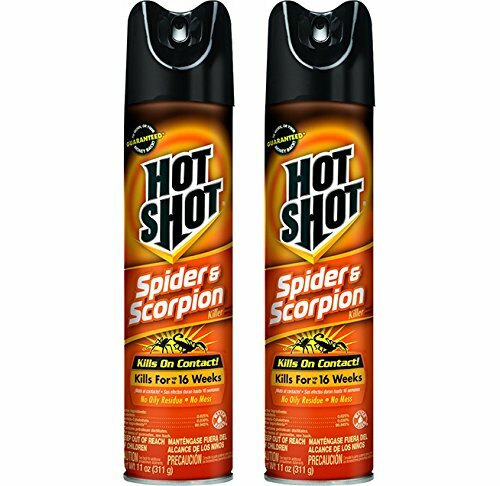 Hot Shot Spider & Scorpion Killer kills a variety of pests including wasps and ants. It acts as a preventive for up to four months after you apply it, offering a barrier defense too. It works quickly, so you’ll get relief right away. It is both odorless and non-staining without the telltale smell of an insect spray. 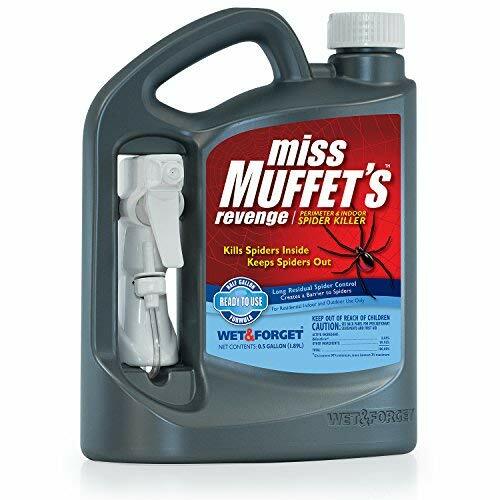 Wet & Forget 803064 Miss Muffet’s Revenge Spider Killer scores a few points for its whimsical name. It is a versatile product that you can use as a repellent, barrier, or insecticide which makes it an excellent buy for an all-around pesticide. It is incredibly effective and works as described. It provides specific instructions for using it inside and outside of your home. You should keep people and pets from the application site until it has dried thoroughly. The residual effects make it an excellent value. These spider sprays will take care of the problem and then some. The issue rests with non-targeted species. Spiders can live anywhere from your attic to deserts and even underwater. They prefer places where nothing will disturb, often lurking in the dark corners of a room or garage. Part of the reason is that they are predators and depend on stealth to capture their prey. They have existed for a long time with fossil evidence going back 318 million years ago. Spiders also have an affinity for water which is why you’ll see them in damp basements. The other factor affecting where they live is the availability of food. They eat insects and sometimes spiders too, depending on the species of which there are more than 40,000 types. They typically live up to two years, though some such as tarantulas have a 25-year lifespan. Having spiders in your home raises two red flags. First, there is the invertebrate itself. Two species, the black widow and brown recluse, have a venomous bite that can harm humans. The wolf spider also poses a risk, but it’s not nearly as dangerous as the other two. If you have small children or pets in your home, your concern is well-placed. The second issue involves their prey. These arthropods live in areas where they can find food. That means you likely have other pests in your home as well. Fortunately, many spider control products work on them too, making them an excellent value for the money. However, that brings up another issue which we’ll discuss next. The essential thing to remember is that the purpose of these products is to kill pests. Many will do it on contact. You’ll see pesticides with a residual effect too which provides significant clues about the safety of these sprays. A lot of them have active ingredients from the pyrethroid class of chemicals. These are synthetic versions of the natural product called pyrethrins. You’ll find pyrethroids in other types of products such as dog flea sprays. Note the use of the word, dog. These ingredients are highly toxic to cats. If you have one as a pet, use them with caution in your home to prevent accidental exposure. There is no question of their effectiveness. These spider sprays will take care of the problem and then some. The issue rests with non-targeted species. Many are broad spectrum which means they’ll kill a wide variety of insects including the beneficial ones like honeybees. They may also affect fish and other aquatic wildlife too. We strongly urge you to read the label’s instructions and cautions in its entirety before using it inside or outdoors to minimize the risk of hurting other species. Don’t forget to look over the first aid advice too to protect yourself, family, and pets as well. The best way to control spiders is to avoid making your home inviting to them. That means cleaning up areas where you prepare food to prevent an insect infestation that will, in turn, lure the predators to your dwelling. Also, empty any sources of standing water in the yard or basement. The next thing you need to do is to focus on the access points to your house. Patch up any holes in your foundation including the spots where utility lines enter your home. The same precaution applies to the exterior doors and screens. Remember that it doesn’t take a large opening for insects to get inside. You likely find that dealing with spiders is a seasonal issue. Like other pests, they retreat to warmer areas when fall approaches. Controlling them isn’t a once-and-done solution, but instead, it’s an ongoing battle. Using different types of products such as repellents can help by creating additional barriers to keep them from entering your dwelling. Finally, use pesticides that have a residual effect for a longer lasting solution. The length of time depends on the ingredients and their concentration. Bear in mind that the manufacturers have to test all products that are EPA-registered. Use them as directed in the recommended frequency for the best results. Only apply them as stated for the safest use.